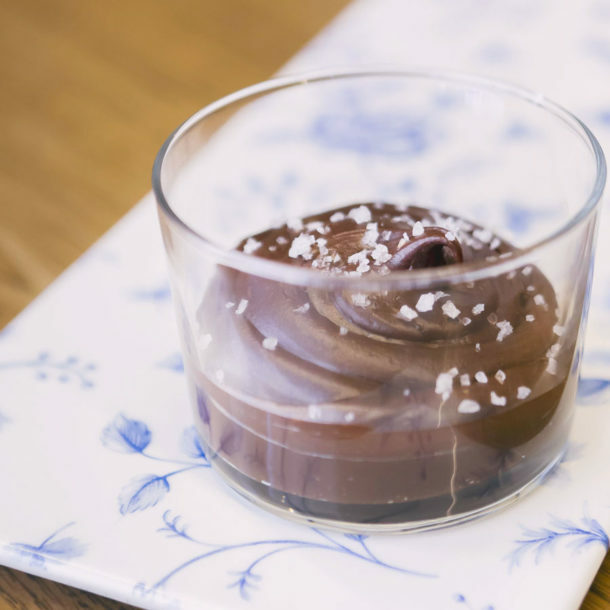 Prepare in less than 30 minutes an onctuous dark chocolate mousse with olive oil. Sparkled with fleur de sel, this sweet and savoury mix will astonish your guests. A healthy and easy dessert with a unique taste. 1. Melt the chopped dark chocolate in a double-boiler. Once melted, remove from the heat. Add the olive oil and mix until well blended. 2. In another mixing bowl, beat the egg yolks with the sugar and the fleur de sel until the texture is light-yellow and creamy. Incorporate the melted chocolate to the mix. 3. Beat the egg whites until stiff and add them very slowly to the chocolate mixture, stirring constantly with a whisk. 4. Divide batter among 6 bowls and refrigerate for a few hours. 5. Just before serving, sprinkle some fleur de sel on every bowl and a few drops of olive oil.